New idea of nondestructive testing was applied for low and medium carbon steel, and high manganese steel known as Electrochemical Nondestructive Testing (ENDT) . ENDT depends on the potential data of steel in different concentrations of mineral acid (HCl used for this work). Required mechanical and physical properties data obtained for standard samples of steel by using destructive testing methods, then these data entered with software designed to calculate physical and mechanical properties for unknown samples. Chemical composition and hardness value would be performed for the unknown sample to be entered with designed software for calculating required physical and mechanical properties. In this work tensile strength, yield strength, elongation, and microscopic structure of 15 standard steel sample were determined by using destructive testing methods. Also ENDT was applied in two experimental applications to investigate the role of process in mechanical properties of carbon steel and 14% manganese steel respectively. Lot of data could be obtained by applying ENDT, so research proposal submitted with this work for data treatment of ENDT. Nondestructive testing equipments which used for investigating mechanical or/and physical properties of steels are mostly in portable design. Properties of steels could be investigated via direct nondestructive testing are limited; such as investigating inside cracks by using x-ray or ultrasonic; chemical analysis, and hardness by using portable emission spectrometer and portable hardness tester respectively. Replica technique is one of nondestructive testing methods which used for microscopic inspection of steels to deduce optical and electron micrographs. There are many indirect nondestructive testing methods, by which properties could be deduced via the conversion of direct data to those indirect; such as conversion of portable hardness tester data to tensile strength. Inspection of steels by using nondestructive testing equipments are usually cost, so collected data are not too much. Indirect data (e.g. conversion of hardness data to tensile strength values) would be calculated by applying hypothetical equations. Let us to introduce our new nondestructive testing method, by which all properties of steels (e.g. tensile strength, fatigue, impact resistance, microscopic structure, etc.) could be deduced indirectly from known values of hardness and chemical composition. This new indirect nondestructive testing method is called electrochemical nondestructive testing (ENDT). Details of this method would be explained in the next sections. If we have simple electrical circuit as shown in Figure (1), in which two metal electrodes are used, one of them as reference and the second is working electrode. There is a potential difference presents between two electrodes when they dipped in strong electrolyte solution, could be collected from reading of potentiometer in Figure (1). As example, two carbon steel samples have different chemical composition (except carbon is the same for two samples) are selected to explain the bases of ENDT. Every sample measured against reference electrode in Figure (1) in different concentrations of strong electrolyte (e.g. HCl solution), and potential difference recorded for each HCl concentration. Figure (2) shows graphical relation between potential difference and HCl concentration, and area under curve could be calculated by using simple software program. The area under curve in Figure (2) is mathematical representation for metal microstructure. Other example, if one carbon steel sample has been measured before and after heat treatment [1-5] in different concentrations of HCl against reference of Figure (1), the results are shown in Figure (3), in which the difference in areas under curves is representation of the changing of microstructure by heat treatment. (i) ENDT applied for steel samples have the same type which taken from the same source (all producing units of tested steel must be the same, e.g. same arc-furnace, continuous casting, and rolling units) and also the thickness of products should be the same. (ii) At least three groups of samples in (i) are selected. Every group includes five samples at least. The five samples in the group should have the same percent of the main alloying elements (e.g. in case of austenitic stainless steel, the main alloying elements are nickel and chromium). (iii) The above samples in all groups, are measured as working electrodes in different concentrations of strong electrolyte solutions as shown in Figure (1). (iv) The required mechanical tests and also demanded microscopic inspection should be performed for all selected samples in (ii) by using destructive test methods. Also hardness should be detected. (v) The obtained data in (iii) and (iv) are considered standard. ENDT software which is suitable this type of steel would be designed. The designed software would be loaded combined with standard data (microscopic structures are used as standard micrographs). (vi) Mechanical properties and microscopic structure could be determined via software of (v) after measuring hardness value and chemical analysis of unknown sample, by using portable hardness tester and emission spectrometer respectively. Application of ENDT for Carbon Steel The steps in section of general concepts of ENDT applications are used for loading standard data of low and medium carbon steel on designed software program. (i) ENDT applied for carbon steel product of one of Egyptian companies, which producing reinforcement steel from steel scrap. The scrap has been melted in arc-furnace (capacity is 25 ton). Then continuous casting machine used for producing square ingots with dimensions 300x15x15 cm. Finally, the ingots have been rolled to round bars with diameter 16 mm. (ii) Three groups of 15 sample were selected, and their chemical composition registered in Table (1). (iii) Potential difference values measured against reference for standard samples as shown in Figure (1). The results were recorded in Table (2). (iv) Tensile strength, yield strength, and elongation of the 15 sample of (ii) were determined by using universal machine, and data are in Table (3). 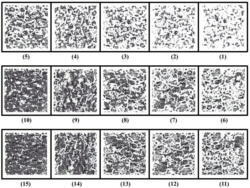 Also microscopic structures of the 15 sample were inspected by using metallurgical microscope, and their micrographs are shown in Figure (4). Hardness values of the 15 sample recorded in Table (1). (v) The standard data and standard microscopic micrographs deduced in (iv), loaded on designed software. ENDT was applied for about 10,000 carbon steel sample and data base of them are available now on CD, where screen of the ENDT application shown in Figure (5). It is obvious above, that data obtained via ENDT for any steel product are not limited. Lot of data could be deduced for small quantity of steel product which indicates that ENDT is applied in wide survey for quality of steel product. These not limited data have another advantage where they can be representative in statistical graphs for investigating the effects of alloying element in increasing or decreasing of mechanical properties. Also these data can provide us useful information about processes used for steel production. Let us submit two experimental applications to clarify the importance of data treatment of ENDT. For the first experimental application, one of steel making companies uses scrap for producing steel products. The company uses arc-furnace for melting the metal scrap. Square ingots are the intermediate steel products that have dimensions 270x13x13 cm. These ingots have been manufactured by pouring melt of arc-furnace in continuous casting machine. The final steel products are round steel bars with diameter 12 mm. These bars have been manufactured by rolling the ingots via rolling process unit. The steel bars are belonging to carbon steel grade. ENDT software would be designed for steel bars according to the above steps. ENDT software was designed at constant conditions for various used processes. Rolling process unit has three programs for controlling cooling rate of steel product during the proceeding of rolling process. The three programs have numbers 1, 2 and 3; and their cooling rates are slow, medium, and fast respectively. Heating furnace of the rolling unit is working by Mazot as fuel. Closed water circuit for cooling ingot mould in continuous casting machine, was attached with one cooling tower. For arc-furnace; refractories inside furnace were constructed directly on the inner body surface of the furnace, and there is not cooling tubes between body and refractories inside the furnace. The above conditions were in the first stage of the project. ENDT was designed for this stage and lots of data collected within several months. The project has been developed by providing arc-furnace with cooling tubes system; and two cooling towers used for continuous casting machine instead of constructed one; also the fuel of heating furnace in rolling unit replaced to be natural gas instead of Mazot. Let us to cover the above first stage of the project and also the development stages by applying ENDT. The statistical graphs of data treatment of ENDT for the above stages, will investigate the effect of process condition on mechanical properties data of steel product. Different conditions of all project stages were recorded in Table (4). Carbon steel has three alloying elements (C, Si, and Mn) affecting on mechanical properties. We will explain the behavior for one of them on mechanical properties over all project stages when the two elements remaining constant values. Figure (6) shows that tensile strength for both curves a and b increases sharply at low percents of Mn, but the rate is reduced considerably at higher concentrations of Mn. In comparison between a and b curves, the curve b seems to be in slightly higher values of tensile strength. Figure (7) shows that curve b has considerable higher values of tensile strength than those of a. Higher values in case of b could be attributed to more fine pearlite produced from faster cooling program number 2. Figure (8) shows that more fast cooling from program 1 to 3 withdrew the two parts of curve toward higher tensile strength values; also the natural gas effect appear in increasing the rate for both parts of the curve. Figure (9) shows straight lines with very low slope for both curves a and b. The lowering of slope could be attributed to the effect of silicon percent on tensile strength is not considerable. The comparison between a and b curves shows that b has slightly higher values of tensile strength but with the same slope. Figure (10) shows slightly effect in slope of b curve toward relatively higher value for tensile strength rate. As shown in this figure also that using natural gas fuel instead of Mazot has considerable shifting the intercept of curve b toward higher value. Figure (11) shows that the intercept of the three curves are the same, but the slope increases considerably in the following order: c b a where the pearlite is more finer in the same order. Figure (12) shows straight line with high slope value for both two curves a and b. The two curves a and b have nearly the same slope with slightly shifting for b on y-axis to relatively higher intercept. Figure (13) shows the three straight lines a, b, and c have higher slopes values than of those Figure (12). The slope increases in the following order: c b a. Also, there is a considerable shifting to higher intercept positions of the three curves more than Figure (12) in the following order: c b a. These higher values of slopes and intercepts could be attributed to using natural gas as fuel instead of Mazot. On the other hand, the above orders have been attributed to the more finer pearlite from program 1 to 3. For the second application ENDT was applied for high manganese austenitic steel. Manganese percent in high manganese steel plays the main role for keeping austenite in room temperature with presence of carbon percent within range 1-1.2%. Quenching heat treatment should be applied for removing carbide formed on austenite grain boundaries to enter inside grains as shown in Figure (14), and heat treatment regime in Figure (15). Presence of carbide on grain boundaries reduces impact resistance of the alloy. Let us to postulate that ENDT software program designed for inspection impact resistance of high manganese steel before and after heat treatment. ENDT software program was designed for casting conditions in sand mould and bentonite as binding material. Another ENDT software program applied for casting conditions in sand mould and sodium silicate as binding material. Figure (16) in which bentonite used as binding material, shows the relation between impact resistance and carbon percent at constant Mn percent value. The maximum point for both curves before and after heat treatment would be at 1.14%. The down width of the two curves is the same, which indicates that increasing of impact resistance after heat treatment depends on solubility of carbide on grain boundaries and independent on carbon percent. Figure (17) in which bentonite used as binding material, shows the relation between impact resistance and manganese percent before and after heat treatment, at constant carbon percent. The two curves before and after heat treatment, have the same behavior, but the curve after heat treatment transferred to higher position. Figure (18) in which sodium silicate used as binding material, shows the relation between impact resistance and carbon percent at the same constant manganese percent in Figure (14). The behavior is the same of Figure (16), but the maximum point would be at 1.09% carbon; also the two curves are showing slightly higher values for impact resistance than those in Figure (16). The lowering of the maximum point than those of Figure (16), indicates that the binding material plays an important role in controlling of the formed microscopic matrix. Figure (19) in which sodium silicate used as binding material, shows the relation between impact resistance and manganese percent at the same constant carbon percent of Figure (17). The behavior is the same of Figure (17), but the two curves are in higher positions, which indicates to more increasing values of impact resistance with increasing manganese percent. The higher positions of the two curves, indicates also that formed austenite in case of sodium silicate has more impact resistance than those of Figure (17) at the same manganese percents. It is obvious in above that infinite series of research works could be occurred in data treatment of ENDT. Let us to submit in this section, the first research proposal of project in data treatment of ENDT. We are looking funding from research foundation agency; such as NSF or other for the following research project. The project could be under title: "Data Treatment During Application ENDT in Foundries and Steel Making Companies". The project could be sponsored by one of international universities to be applied in multitude of foundries and steel making companies. The experimental part of the project is never cost because all data could be collected from routine work performed in laboratories of the foundries and steel making companies. The interested faculty members who ready to collaborate in performing the project can contact the author.